Nepal’s obsession with ‘development’ and ‘growth’ is causing enormous collateral damage to its culture and heritage. In a hurry to improve access in this mountainous land, we are following a development model that is obsolete and a copy paste of so-called ‘developed’ countries. The most glaring example of this is the spread of new roads to once-remote valleys. One of the easiest ways to argue for a development budget these days is to propose a road, even if it from nowhere to nowhere. Driven by greed and corruption, roads are being built where one already exists and even if it would end up destroying an area’s culture and tourism prospects. A road comes with the propaganda of development and creates the illusion among locals of manna from heaven. Aided and abetted by unscrupulous contractors in the district capital, roads have destroyed much of what used to be Nepal’s unique tourism selling point in the Annapurnas and other Himalayan valleys. Undoubtedly, villagers in remote areas would want roads because they get access to markets, health services, education, and makes it easier to get to and from the city. But the way the roads are being built in Nepal is bringing little development, mostly destruction. The government wants to build eight strategic highways under the North-South Transit Road Development (NSTRD) to serve as trade arteries between China and India and also to use river corridors to connect Nepal with Tibet. Even though the road through the Manaslu Conservation Area and the Tsum Valley (see map) is not even included in the NSTRD, it has already been sanctioned and construction has begun from the south. Budi Gandaki to Larkya Pass has now become the third most popular trekking route in Nepal as roads have destroyed other areas. Some 10,000 people, including 4,000 Tsumpa who live in this isolated and sacred side-valley of the Budi Gandaki behind Ganesh Himal will be affected by the road. 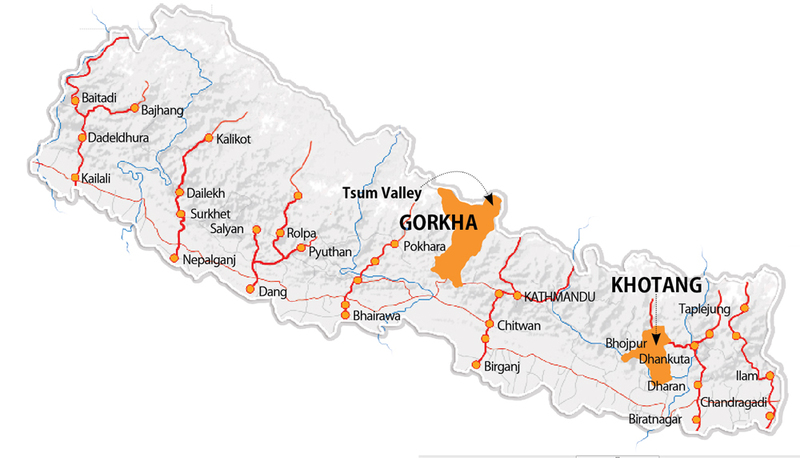 The Gorkha district administration has sanctioned a road up the Tsum Valley to the China border. No one asked the Tsumpa about the road, decisions were taken by local politicians and contractors far away in Gorkha. There was no effort to organise prior consultation, when the alignment started being surveyed earlier this year. No one tried to find out the economic, cultural and environmental impact of the road on this fragile valley and to minimise the damage. About 35 km of the road has now been surveyed and the alignment slices through chortens, monasteries, and mani walls of historical and cultural significance, some of which are more than 1,000 years old. Tsum Valley is known as the Beyul Kyimolung, the holy hidden valley of happiness, first described by the Guru Rimpoche Padmasambhava in the eighth century. Milarepa meditated in the cases of Piren Phu and there are centuries old nunneries here. The valley is part of the sacred Kyimolung circumambulation of Siringi Himal. 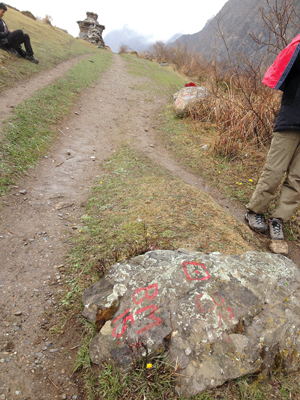 Mustang and Manang suffered vandalism, theft and destruction of their Tibetan Buddhist and Bon Po heritage after roads were built, a similar fate awaits Tsum. The road is supposed to link India and China via Nepal, but the 5,093m high Ngula Dhajen pass is covered with snow and ice for more than four months in a year and there is no road yet on the Chinese side. Not only is this road environmentally and culturally destructive, it doesn’t even make economic sense. Like elsewhere in Nepal, this is a road driven by greed and ambition of lowland politicians and contractors who want to profit from the government infrastructure budget by building a harmful road. Experience from the Annapurna area has shown that roads can help locals connect to markets, spread health and education, but it must be done in consultation with local people, respect local heritage sites, reduce the harm to the environment, and maximise the benefits of trade and tourism. 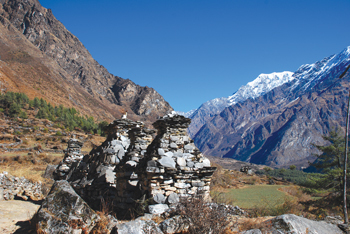 The current alignment would not just destroy heritage sites in Tsum, but wreck the trekking route up the Budi Gandaki. The locals of Tsum are not against the road per se, they are against the politicised top-down decision making without prior consent of the locals, and a complete lack of responsibility for the environment, cultural, and economic impacts. If the Tsum road is to go ahead, the locals insist on an alternative alignment that protects their holy sites and a vital trekking route. Sonam Lama is a native of Tsum Valley and an architect who specialised in emergency architecture and urban development from Germany and Spain. The factor determining how prosperous the country’s 20 Tarai districts are depends on whether or not they have roads connecting them to adjacent hill districts, a study has shown. More than half of Nepal’s population lives in the plains and their standard of living is directly linked to whether or not their district has road access to the north. This shows that the economies of the Pahad, Himal, and Tarai districts are inextricably linked. When they are connected to the hills to the north, there is more economic activity and more customs collection from points on the Indian border. Of the 20 districts in the Tarai, nine (Jhapa, Morang, Sunsari, Bara, Parsa, Chitwan, Rupandehi, Dang and Banke) have had road links to the north for decades and these are far ahead of the other plains districts. The 11 districts which are not connected yet, the pace of development is slower, such as in the eastern Tarai. One example of this is Saptari and its capital, Rajbiraj, which has been overtaken by Biratnagar and Chandragadi because of its lack of road access to hill districts directly to the north. Madhesi stalwart Gajendra Narayan Singh understood this and had long advocated a highway linking Rajbiraj with Udaypur and on to Diktel of Khotang district. But the planners in Kathmandu ignored him. However, Saptari is now poised to reap the benefit of new roads to Okhaldhunga, Bhojpur, and Khotang. “Once those roads are built and we construct the link road to the Indian border at Kunaili, Rajbiraj will see an economic boom,” says Satrughan Rauniyar of the Saptari Chamber of Commerce. Similarly, it is because Ramechhap and Dolakha in the hills have not been linked to Sarlahi, Mahottari, and Dhanusha in the Tarai that these plains districts have been left so far behind. Even though the BP Highway has linked Kathmandu with Janakpur and Sindhuli, the lack of a bridge over the Sun Kosi has obstructed economic activity. Comparing the economies of Bara and Parsa with Rautahat makes this even starker. Bara and Parsa are directly linked to Kathmandu and Chitwan, whereas Rautahat has no road links north of the East-West Highway. “Since the fast-track highway to Kathmandu is still some years away, we will have to wait to take benefit from linkages with the hills,” says Dharmanath Jaiswal, a businessman in Gaur. It is because it has a highway linking it to the north that Rupandehi is far ahead of neighbouring Kapilbastu and Nawalparasi. Proof of this is the growth of economic activity in Butwal, which is seeing another surge of development after the district got its road link to Gulmi. 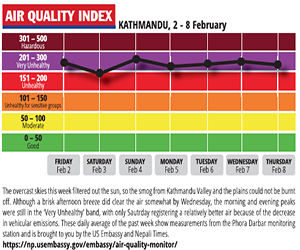 Another proof is the town of Bardibas which has seen a spurt in activity after the BP Highway connected it to Kathmandu. Collating the customs revenue data of the 19 customs points on the Indian border shows that there are more goods being traded if the towns have links to the north than if there is just a road link to India.